Public consultation of the proposed area and boundary for the Roman Road Neighbourhood Plan is now underway. 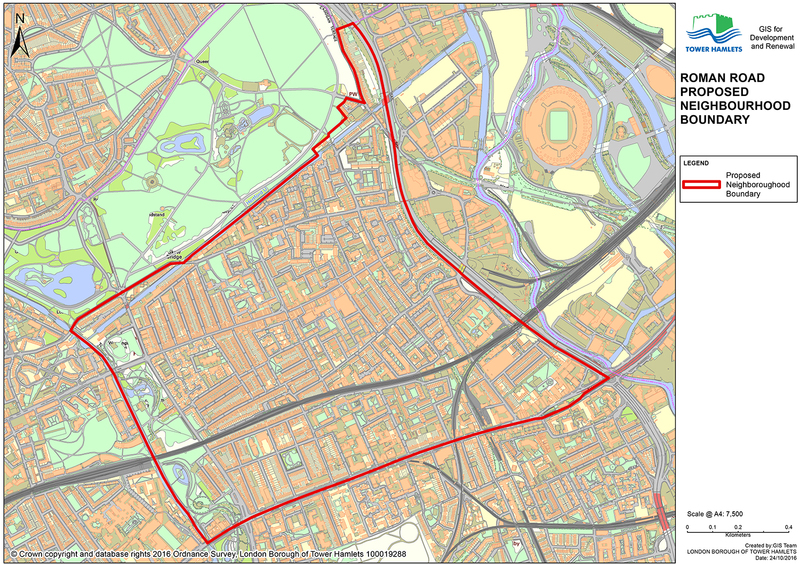 Following eight months of consultation, the Roman Road Neighbourhood Plan group submitted the proposal for the Roman Road Neighbourhood area and boundary on 28 October 2016. The application met the regulatory requirements and the consultation period is now in progress. Consultations included an Initial inaugural public meeting in February 2016; one-to-one meetings with key community members; surveys; creative community engagements events including the High Street Reimagined Guided Tour; online presence via a website, Facebook and Twitter, and direct contact with circa 50 community groups. Many alternative boundaries were suggested and consulted with the public including the inclusion/exclusion of Fish Island, Cadogan Terrace, Mile End Park and the area south of the railway line down to Bow Road. The consultation period will run from 11th November to 23rd December 2016. The reporting and sign-off process will be conducted during January 2017 and the determination will be announced before 3rd February 2017. Members of the public can find information about the Roman Road proposed Neighbourhood area and boundary is live on the Neighbourhood Planning webpage and also on the Consultation page. Hard copies of the document will be available in the Idea Store Bow and at Town Hall reception during the consultation period. During the consultation, the Council will also email statutory consultees to inform them of the consultation. The next step for the Roman Road Neighbourhood Plan group is to seek formal approval of its Forum. A Neighbourhood Forum must contain at least 21 members. Membership to the Forum is open to all people who live or work in the local area. Forum members will be able to vote on proposed policies for the Neighbourhood Plan. Once the Boundary and the Forum have both been approved, the Forum's Steering Committee will need to further publicise the Neighbourhood Plan, increase its Neighbourhood Forum membership, and start developing local planning policies in collaboration with local stakeholders. This process is estimated to take a further 12 months. The proposed Roman Road Neighbourhood Forum currently has 150 members. To secure your right to vote on proposed planning policies for the Neighbourhood Plan, join the Forum here.